"I'm a third generation fisherman. Generally speaking the fishermen are really keen to keep it going for many years to come. The word sustainability means a lot to me." One of Victoria’s oldest professional fisheries, it is likely that fishing in Corner Inlet started around 1840 when the area was settled. The fish caught were smoked, salted or dried and sent to the gold rush towns. that has been passed down through generations. Corner Inlet is now Victoria’s largest Bay and Inlet fishery, providing around 265 tonnes of fresh seafood annually, most of which is transported to Melbourne, sold and eaten within hours of being caught. A rich diversity of Victorian’s favourite and iconic seafood species are caught in Corner Inlet, using low-impact, sustainable methods that have been employed for decades from small open boats. ​WHERE IS THE CORNER INLET-NOORAMUNGA FISHERY? The marine waters of Corner Inlet and the Nooramunga embayment are 160km southeast of Melbourne on the eastern side of Wilsons Promontory. The system is highly tidal with deep channels and large shallow banks that allow the growth of seagrass, important habitat for fish species. The area is a multi-use marine park where 1550 hectares is restricted to all forms of fishing (shown by green outline in far-right image). The ports of landing are Port Welshpool, Port Franklin and Port Albert. ​Like all Bay and Inlet fisheries, Corner Inlet fishers catch a mix of species. Rock Flathead, King George Whiting, Southern Calamari and Garfish make up 60% of fish caught by weight. Silver Trevally, Australian Salmon, Gummy shark and Flounder are also caught regularly. In 2014/15, the fishery produced 263 tonnes of fish for the Victorian people. HOW ARE CORNER INLET FISH CAUGHT? Corner Inlet Fishers use highly sustainable methods to fish. One or two fishers man an open 6-8 metre boat, with some fishers working in a ream of two boats, sharing the catch. About 70% of the catch is caught using haul seine nets, and the rest are mostly caught using mesh nets. The nets are mostly hauled manually as has been done since the fishery began. Corner Inlet fishers have created their own haul seine gear and fishing technique, although there are some that share methods with the other Bay and Inlet fishers from Port Phillip Bay and Gippsland Lakes. Haul seining is a traditional style of fishing that has been used in Victoria’s Bay and Inlets for over 100 years. In shallow water, the haul seine is deployed, in a place based on fisher knowledge and experience. The haul seine forms an arc, and is used to surround fish and draw them towards the boat, avoiding fish getting stuck in the net, which means the fish are alive once encircled. Then the fish are sorted while in the water. The fish of market value are removed using hand-held dip nets and are placed into the ice slurry box. Non-market fish are returned immediately to the water without harm. Research has been shown that 97% of released fish survive, making the fishing method highly environmentally friendly (Knuckey et al, 2002). Mesh nets are one of the oldest forms of fishing and are highly selective. It is a panel of net that is held vertically in the water. 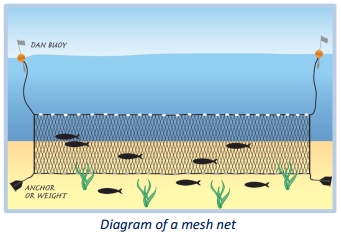 The mesh size and the way the netting is constructed determines what size and species of fish is caught. Knowledge of fish movements is needed so that the net is set in the correct position. Fishermen in Corner Inlet use a range of mesh nets depending on the season and what they want to catch. How is the Corner Inlet-Nooramunga Fishery Managed? The number of Corner Inlet-Nooramunga fishing licences are limited to 18 transferable licences. The Fishery also operates under strict government-regulated management arrangements with a voluntary Code of Practice. Fishing days, with no fishing on weekends (starting midnight on Friday to 5pm on Sunday). Gear type, with haul seine nets no longer than 650 metres, mesh nets no longer than 1300 metres, long lines no more than 400 hooks, and a maximum of 20 hoop nets. Area closures, with 1,550 hectares prohibited to all methods of fishing in the marine park (bottom right image). No more than two haul seine shots per day. Haul seine shots are to be completed within 90 minutes. Fishers can only fish one side of Fishing Reporting Areas 1, 2 & 3 or Areas 4 & 5 on one day (bottom left image). Bay and Inlet fisheries are naturally variable fisheries, and highly dependent on environmental conditions outside the Bays and Inlets. Corner Inlet is also sensitive to changes in the Catchment and fishers are highly engaged in projects to make sure the Inlet stays clean and healthy and full of fish. The 2016 Fisheries Assessment of Corner Inlet-Nooromunga found that King George Whiting are currently very abundant and the fishery is in a healthy state, which is great news for this favourite Victorian species. Southern calamari, Flounder, Silver Trevally, Gummy Shark and Australian salmon are also looking good. Although the 2016 Assessment shows a recent decline in Rock Flathead catches, but the weight caught is still within 20% of the long-term average. Read the 2016 Fisheries Assessment here. Corner Inlet fishers are part of a voluntary industry-driven environmental initiative – the Victorian Bay and Inlet Fisheries Association Environmental Management System. It enables Bay and Inlet fishers to identify and assess environmental risks, develop management actions, and protect the environment on which their livelihood for the future depends. Read the VBIFA EMS here. Corner Inlet fishers started the Corner Inlet Fisheries Habitat Association to develop and promote a habitat protection strategy for the Inlet, and they currently apply an industry Code of Practice for seine net fishing. Corner Inlet fishers have long been engaged in research to improve the water quality and seagrass beds for fish habitat. Seagrass is essential for the fishery and the Corner Inlet ecosystem. Fishers have worked for years with government, scientists, farmers and others to understand why seagrass coverage has been declining and how they can combat it. The most recent FRDC project, “Protect your catchment, Protect your catch” is an example of scientists and industry teaming up to create a better future for the fishery.